Everyone has the right to look beautiful. Good looks with gorgeous skin makes you feel more confident, jovial, and presentable. You seem to gather a lot of attention and it makes you one of a kind. But wait a minute. Are you suffering from dry skin and its harsh effects? In this looks-obsessed world when everyone is competing to look the best, dull and lifeless skin might act as a huge setback for you. However, lucky for you, the flawless, blemish and acne-free skin that you have always desired is no more a dream, but reality. 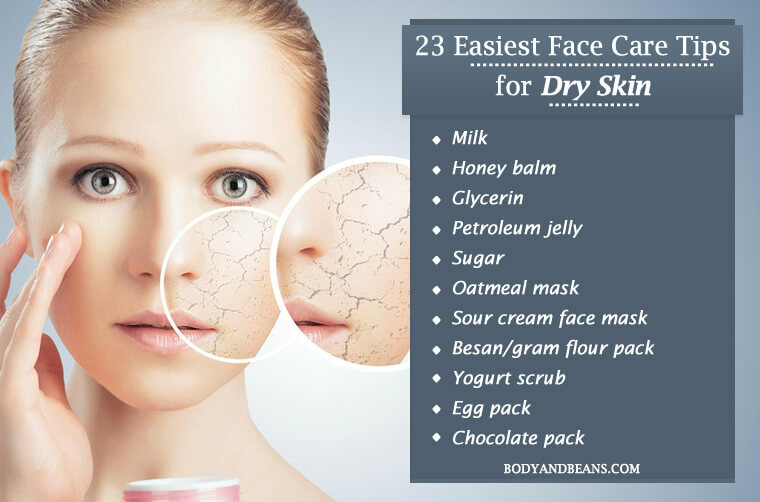 I will share with you top 23 easiest face care tips for dry skin that actually works like magic. 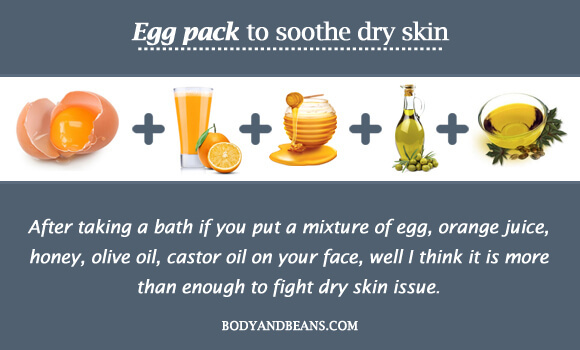 These are some of the easiest tips that can make your dry skin face-care much easier. Dry skin is very irritating and may spoil your looks. It is a common problem faced by most people at some point of time. Pollution, sun’s harmful rays, winters or windy weather can wreak havoc on your skin to make it dry. Due to lack of moisture in the skin, it becomes dehydrated, loses its flexibility and becomes cracked, scaly and even itchy sometimes. Now everyone is aware of the basic skin care technique – Cleansing, Toning and Moisturizing. But is that enough? Well you probably have tried every new face wash, sunscreen, and anti-ageing cream that hits the market. And you are ever so willing to try anything under the sun to get beautiful skin. However, it is not an overnight miracle. The harmful chemicals in the commercial products often worsen the skin quality instead of improving it. There are various face care tips that you may have tried, but did you know that different types of skins require different kinds of care? Nevertheless, if you know the proper skin care techniques, you can avoid skin damage and easily look your best. And if your skin type is dry, then this is the post worth reading, because today I am sharing some of the best and most natural and easy to apply face care tips for dry skin types. The reason I thought of discussing the different skin types is that each individual has a unique skin type. Making the right choices about your skin care starts with knowing your skin type. Different skin types are genetically determined but choosing the best skin care for your face and body is essential to care for your skin’s health, slow the ageing process and look after yourself. Normal skin– Ok this is the most desired skin type. It has good blood circulation and there will be no trace of sebum (or oil) on the tissue. Normal skin is soft, smooth and even. Oily skin– It will have lots of facial oil on the tissue, mainly from the cheeks, nose and forehead. Here the sebaceous glands are overactive secreting extra oil. Oily skin may be due to hereditary factors, diet, hormonal changes, pregnancy, unsuitable cosmetics and stress. This skin type is prone to acne and pimples largely. Dry skin– This skin type has low level of sebum and does not maintain oil easily. It is often flaky and tight after being wiped. Skin has lack of moisture, which leads to the dryness. Combination skin– In this skin type oil is produced in the nose especially in the T-zone and in the forehead whereas the other facial parts like the cheeks, mouth and eye region remains dry. Sensitive skin– This skin type can mean different things to different people. It may be due to skin conditions like rosacea, eczema or allergies. Such skin can become inflamed and irritated easily. I hope that you have identified your skin type. Well in this article, I will discuss about dry skin issues. Are you ready? Ok so let us get started. Dry skin needs an effective lubricant to re-hydrate it. Many dry skin products are available on the market to treat – from mild to extremely dry skin. These over-the-counter chemicals loaded products seldom work, but burn a hole in your pocket. On the other hand, the dry skin home remedies are least expensive, but can treat your dry skin with natural ingredients, without any side effects. Here are 23 brilliant face care tips for dry skin to get that glow you have always wanted. Browse through the beauty secrets, tackle your skincare issues and follow the tricks regularly to get beautiful skin naturally and easily at home. Milk, which is the primary ingredient in the preparation of ghee, butter or yogurt, is one of the perfect skin foods for dry skin. It is one of the most effective ingredients that you can use for skin care. The healthy fats and amino acids in milk keep the skin hydrated and moisturized. Just note down the easy steps. Boil a cup of milk till it becomes thick and reduce in quantity. Allow it to cool down and apply it all over the skin especially the face. Let it dry and then wash it off. Use this remedy every day to get that perfect milky glow. You can also take a spoonful of milk cream or the thick creamy top layer of the milk and massage it on the face and neck in a circular motion. Let it sit for 10 minutes and then wipe off with cotton soaked in cool water. Traditionally, honey has always been an important part of skin care. It being a natural humectant gives your face the adequate moisture. The antioxidants in honey soften premature fine lines and wrinkles caused by lack of moisture in the skin. 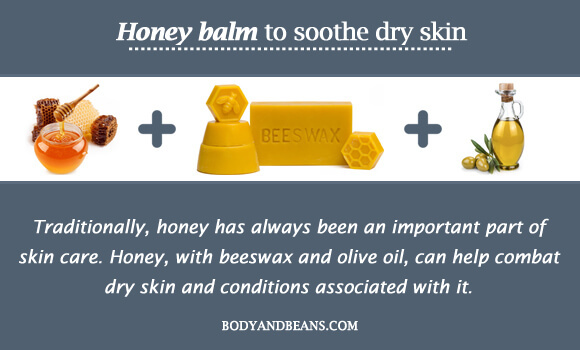 One research conclusively proved that honey, when used along with beeswax and olive oil, can help combat dry skin and conditions associated with it. 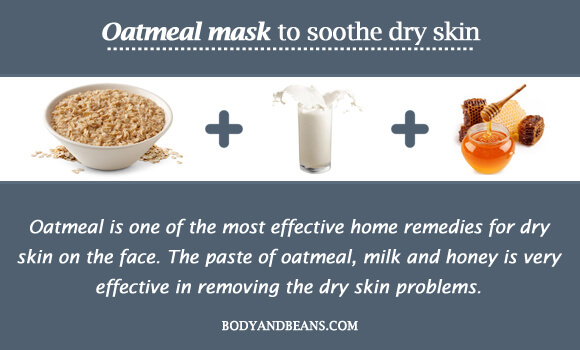 Oatmeal is one of the most effective home remedies for dry skin on the face. It also has antioxidant and anti-inflammatory properties, which help you, deal with the symptoms that dry skin causes. The paste of oatmeal, milk and honey is very effective in removing the dry skin problems. Dryness can cause your skin to turn flaky. The lactic acid in sour cream gently exfoliates the dead skin cells and moisturizes your skin, making it smooth and supple. You can make a paste of sour cream and gram flour, apply it on your clean face, and wash with cold water after 20 minutes. This remedy will work wonders for you. Besan hydrates dry skin due to the presence of a humectant, which prevents water loss from skin. If you are adding turmeric, honey, milk and freshly squeezed limejuice to it, it becomes the perfect paste for dry skin. Lime fights blemishes due to the presence of vitamin C in it. 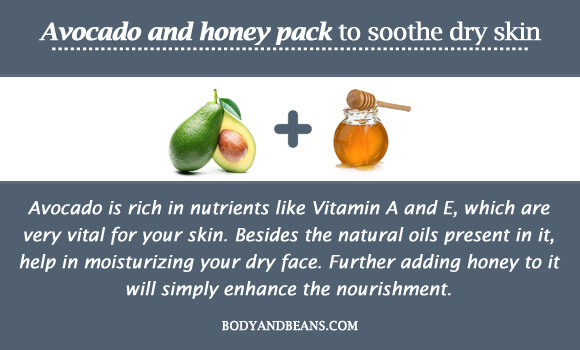 Milk and honey also have nourishing properties, which is why this pack is an effective way to get hydrated and soft skin. Dry skin is incredibly sensitive. No matter how rough your skin feels, using abrasive scrubs can make your skin worse. The best way to exfoliate is to use a gentle and moisturizing scrub that removes dead cells without damaging your skin. Add yogurt to honey and add sugar when they are combined. Scrub and massage your face in gentle circular motions. Rinse with cold water after 5 minutes. Yogurt contains lactic acid that exfoliates your skin and treats dryness. The sugar removes any flakiness while the honey hydrates your skin. Avocado is rich in nutrients like Vitamin A and E, which are very vital for your skin. Besides the natural oils present in it, help in moisturizing your dry face. Further adding honey to it will simply enhance the nourishment. I know this sounds yummy. 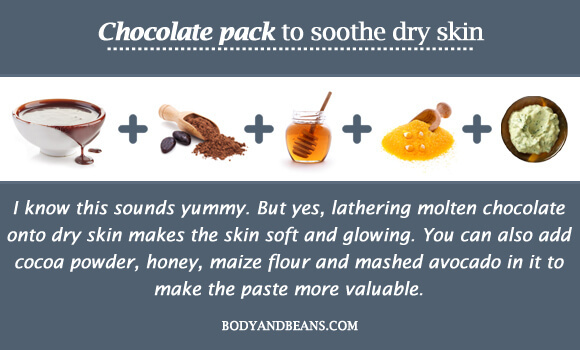 But yes, lathering molten chocolate onto dry skin makes the skin soft and glowing. You can also add cocoa powder, honey, maize flour and mashed avocado in it to make the paste more valuable. Ok so here all you need is pure ghee. Ghee helps in activating sebum secretion and healing the dryness making it one of the most effective dry skin treatments at home. You can buy some pure ghee, or get butter and make ghee at home. Gently rub in some pure ghee onto your face and other affected areas in slow and circular motion so that it is absorbed by the skin. After few hours, take a shower. Soak carom seeds in hot water for half an hour. Let it cool and then strain the water. Then wash your face with this water and you are sorted. 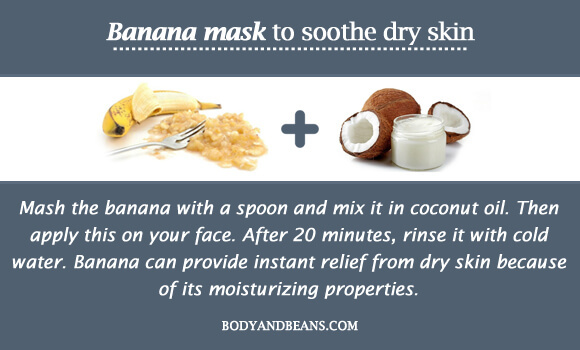 This is a really good natural face care tip for dry skin type and it works magically. Papaya is a magical fruits which has many health benefits. It is as ideal fruit for dull skin. It not only adds brightness and clarity to the skin but also repairs and moisturizes dry skin. 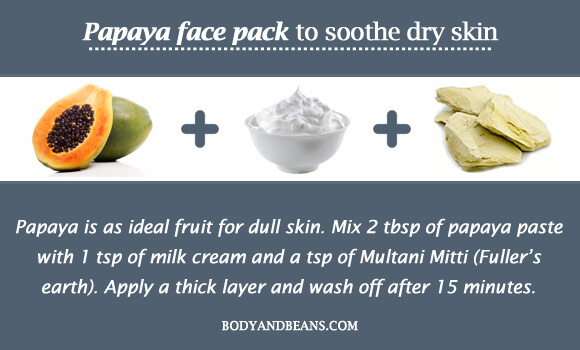 Mix 2 tbsp of papaya paste with 1 tsp of milk cream and a tsp of Multani Mitti (Fuller’s earth).Apply a thick layer and wash off after 15 minutes. The structure of jojoba oil closely mirrors that of sebum, your body’s natural oil. This makes jojoba oil an excellent moisturizer for every skin type. It also has anti-inflammatory properties that help soothe your skin. If your skin is excessively dry then go for Vitamin E oil. It is rich in antioxidants that also helps clear the skin. It further helps in fighting against skin aging, scaly skin, and other related skin problems. Just take some Vitamin E capsules and take out the oils from it. Massage the oil gently on your face for a few minutes and leave it overnight. While washing you can use honey body scrub for best results. Olive oil has moisturizing properties, which nourish your skin. The presence of polyphenols in olive oil also helps counteract the damage caused by the sun. Mixing lavender oil to it will add to the good effect. Lavender oil has antimicrobial and anti-inflammatory properties, which help reduce itchiness and irritation caused by the dry skin. You can replace lavender with castor oil as well. Castor oil penetrates the skin up to three layers more than any other oil. Take virgin coconut oil, apply on the dry areas of your skin, and let it get absorbed by the skin. Daily application of coconut oil does wonders at replenishing and locking in the natural moisture of the skin. However it is just a myth that putting coconut oil on your face leads to facial hair growth, so do not worry about that. Mash the banana with a spoon and mix it in coconut oil. Then apply this on your face. After 20 minutes, rinse it with cold water. Banana can provide instant relief from dry skin because of its moisturizing properties. Due to the high level of fats present in coconut oil, it deeply conditions your skin, leaving it smooth and supple. 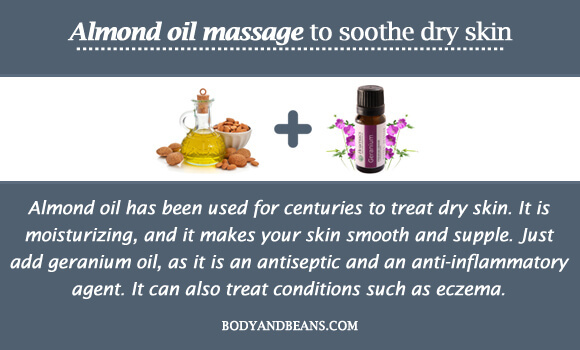 Almond oil has been used for centuries to treat dry skin. It is moisturizing, and it makes your skin smooth and supple. Just add geranium oil, as it is an antiseptic and an anti-inflammatory agent. It can also treat conditions such as eczema. Limejuice along with warm mustard oil is one of the best combinations to exfoliate dry skin. With regular use, your hard and dry soles will become soft and supple. All you need to do is to dip the lemon slice into the mustard oil and rub it onto hardened surfaces like soles. After taking a bath if you put a mixture of egg, orange juice, honey, olive oil, castor oil on your face, well I think it is more than enough to fight dry skin issue. Eggs are an excellent source of protein, which makes them a necessary addition to your skincare regime. Orange juice, due to the presence of vitamin C, helps in getting rid of blemishes. Honey, olive oil, and castor oil are known for their moisturizing properties, which will help you get rid of your dry, flaky skin and achieve a soft, supple skin. 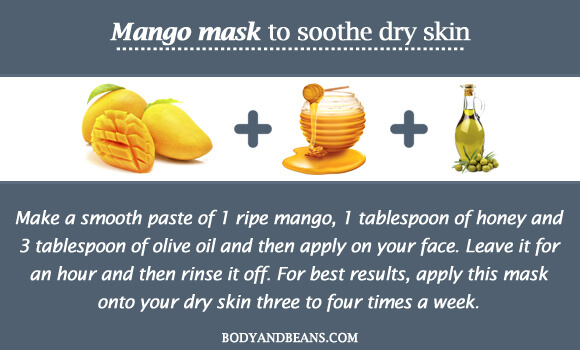 Mango mask contains 1 ripe mango, 1 tablespoon of honey and 3 tablespoon of olive oil. 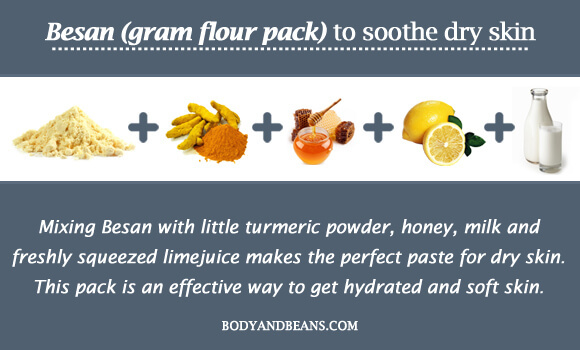 Make a smooth paste of these ingredients and then apply on your face. Leave it for an hour and then rinse it off. Mango is a rich source of vitamin A that hydrates and moisturizes dry skin. It also heals dry, flaky skin and rejuvenates dull skin. Honey is known for its nourishing properties, and olive oil has great moisturizing benefits on dry skin, thus making this mask ideal for those with dry, flaky skin. For best results, apply this mask onto your dry skin three to four times a week. Glycerin is another wonderful humectant and emollient which works wonders not just on the dry skin but also chapped lips. You must have the ad of Pears soap. An innocent and cute child who cannot resist touching her mother’s soft and supple skin. Well it is the glycerin content in Pears that makes it so skin friendly. 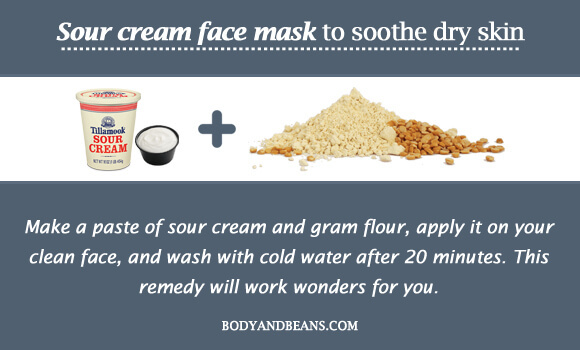 For improved results, you can also mix rose water and then apply on your dry face. Leave it for an hour and then wash it off. This natural ingredient has been used to pamper dry skin, since ages. You can also combine it with glycerin in equal proportions, and apply over your dry skin to slough away the flaking skin and make your skin soft and smooth. It is one of the best home remedies for all types of skin conditions that erupt because of dry skin. Sugar is a great natural exfoliant for dry skin. It conditions, smoothes and moisturizes the skin. You can choose the white granulated sugar or the brown sugar to exfoliate skin. Simply dissolve 3 tsp of sugar with warm milk and apply it on your face, neck and hand. Once it dries completely, remove the pack by scrubbing in a circular motion. Wash off with lukewarm water. So now, you know how a little effort and care towards your dull, dry skin can give it an irresistible radiance and silky sheen. The above- mentioned face care tips for dry skin are some of the best skin-nourishing beauty recipes, intense hydration treatments and moisture boosting formulas to reward you with the glossy bright skin that you have always dreamt off. Face care for dry skin or any other types of skin is not difficult, especially when you know how to do it right. You can use day to day and easily available ingredients like honey, curd, oil, ghee etc. However, you must know that merely putting beauty face packs will not help. It is very essential for you to eat a healthy, balanced diet, avoid junk foods and drink plenty of water to get that glow from within. Until then, try out some of these face care tips and see which one works for you best. And feel free to share your natural remedies for dry skin in the comments below for the benefit of other readers. And finally, if you liked this post, feel free to share and spread the word!